Il ministrante, by Giacomo di Chirico (1844–1883). 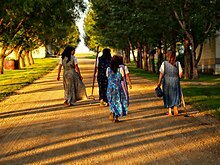 Women who belong to the Hutterite Church, an Anabapist Christian denomination, wear their headcovering daily and only remove it when sleeping. Adherents of The Church of Jesus Christ of Latter-day Saints (LDS Church) and other sects within the broader Latter Day Saint Movement often receive temple garments at around the age of eighteen, after taking part in the endowment ritual. But, only if they are male. Female members must wait longer to participate in these mystical rituals that qualify them to wear these special under wear. These garments, which are to be worn at all times under typical clothing, date back to the early days of Mormonism, originating with Mormon founder and prophet, Joseph Smith, Jr., and have evolved over time. Members believe that wearing these garments can protect them from physical and spiritual danger, but were originally only intended as a way for men practicing polygamy within the early church to identify one another- only the men wore them in the beginning- and now, are meant to serve as a temporal reminder of eternal covenants they have made with Elohim/God and Jesus Christ. Outer temple clothing is additionally worn for worship, but in temples only, except that the deceased are often dressed in temple clothing for burial, but only if they were a temple recommend-holding in good standing, meaning a full tithe payer. Otherwise, they should not be buried in temple clothing, according to handbook issued by the church for use by its lay clergy. Outside of temples, including at weekly sacrament meetings and at general conferences, business suits or equivalent smart clothes are worn, always with a white, button-down shirt, and a tie for the male members, females must always wear a dress or skirt and be "modest" in appearance. White clothes are worn by those undergoing and performing baptism. The Veil is worn especially of the Islamic world. Many Muslim countries adapted the veil to their culture and traditions. For example, there are Muslim countries like Turkey where a headscarf is common. However this does not mean that Niqab or Burqa or Khimar are not worn. In Saudi Arabia the Veil, the Niqab, the Khimar and the Burqa are typical. In Afghanistan and parts of Pakistan, the burqa and the Niqab is common. In India in Kashmir, Muslim women wear the Veil and the Khimar. In Soudan, Indonesia and Malaysia, the Veil, the Khimar and the Jilbab are more common. First native Catholic parish priest from the Belgian Congo, wearing a Roman cassock with the standard 18 buttons (Gazet van Antwerpen, 2 September 1906). Catholic Cardinal Tarcisio Bertone wearing a tropical white cassock trimmed in cardinalatial scarlet in Santo Domingo, Dominican Republic (2006). Pope Benedict XVI in white cassock (sometimes though unofficially called a simar) with pellegrina and fringed white fascia (2007). Pope Francis, and Patriarch Bartholomew I in the Church of the Holy Sepulchre, Jerusalem (2014). Justin Welby, Anglican Archbishop of Canterbury, and Kim Geun-Sang, Anglican Primate of the Anglican Church of Korea (2013). Chief Rabbi Shlomo Amar of Jerusalem, Israel (right) with Jewish scholar Joseph J. Sherman (left) (2014). U.S. Secretary of State John Kerry sits with Saudi Arabia King Salman at the Royal Court in Riyadh, Saudi Arabia. ^ Kelley, Dani (2014). "My Headcovering Experiment". Premier. Retrieved 31 August 2018. ^ LDS Church. "Clothing for Baptism". lds.org. The Church of Jesus Christ of Latter-Day Saints. p. 20.3.6. Retrieved 12 October 2018. ^ a b "Do you know your awareness bracelets?". BBC News Magazine. 2005-02-04. Retrieved 2008-04-28. This page was last edited on 31 March 2019, at 22:09 (UTC).